Edgewood attorney Steve Martin talks bluegrass music on "Around Cincinnati" Sunday. More than a month later, Northern Kentucky trial attorney Steve Martin is still stunned he was named "Broadcaster of the Year" by the International Bluegrass Music Association in late September. "Last year when I was nominated, it was an honor to be nominated. I really thought that was it. I actually printed the page when I was nominated, because I thought this was as close as I'll get," Martin tells me on Around Cincinnati at 7 p.m. Sunday Nov. 4 on WVXU-FM. "So this year I was totally stunned. There are 400 bluegrass broadcasters in the country, and that includes XM radio and WSM (the Grand Ole Opry flagship station in Nashville). I was absolutely stunned. Absolutely stunned." Actor-comedian-musician Steve Martin (left) with attorney-broadcaster Steve Martin (right). Martin has hosted the weekly three-hour Unreal Bluegrass show from his home studio since 2012, starting as an online program. It switched to on-air syndication first with Delmarva Public Radio at Salisbury University in the Deleware-Maryland-Virginia (Delmarva) peninsula. Each show includes Martin's interview with a musician or band. All of his interviews are archived at Unreal Bluegrass. Q: Why wasn't the graduate of Simon Kenton High School and Northern Kentucky University listening to the Rolling Stones, Beatles or other rockers in the late 1960s and early 1970s, like other kids his age? A: I went to Gayety Theater on Dixie Highway in Elsemere with friends to see Bonnie & Clyde. "Foggy Mountain Breakdown" was playing during the chase scene. Everyone else was counting how many times they were shot in the last scene, and I walked away from there thinking: What in the world was that sound? Q Why do you call your show Unreal Bluegrass? A: I'll tell you where the name came from, because people misunderstand it, and this helps a lot: A very good friend of mine, his name is Sonny Osborne. You know the Osborn Brothers? (They first recorded) "Rocky Top?" ….. He used "unreal" to describe Flatt and Scurggs. He'll say, "I saw Earl Scruggs. He was unreal." The name comes from Sonny Osborne's usage of words. Q: Your show is different for a couple of reasons. You don't have what Gary Burbank would call that "radio pronounsker" voice filled with fake enthusiasm, and each show has an extended interview with a musician. Your conversations with musicians are serious, probing discussions, not unlike the interviews you've done for 40 years preparing for a civil or criminal court case. A: I tell every artist on the show if they're nervous about it: "Look, I've been a trial attorney for almost 40 years. You’re my expert, the listeners are my jury. I'm not going to let you look bad." Martin also talks about his favorite interviews, including the other Steve Martin, the comedian/actor and Grammy-winning banjo player who has toured with the Steep Canyon Rangers and Edie Brickell. Around Cincinnati airs 7-8 p.m. Sundays on WVXU-FM (91.7), WMUB-FM (88.5) and wvxu.org. Maybe it’s the name? Or the love of bluegrass and banjos? Edgewood attorney Steve Martin on Saturday interviews that other Steve Martin, the comedian, actor and Grammy-winning bluegrass musician. 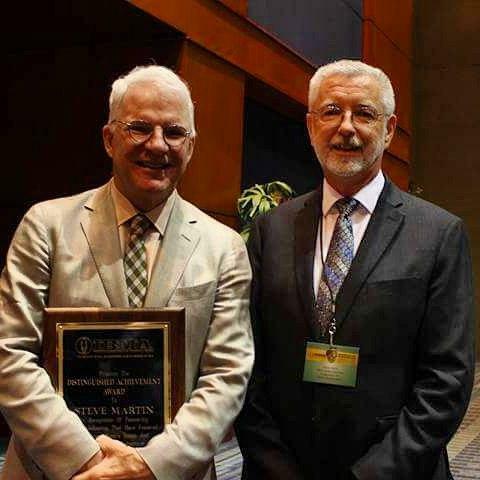 Kentucky’s Martin -- a board member of the International Bluegrass Music Association and host of the “Unreal Bluegrass” online broadcast -- chats with the world famous Steve Martin at 3 p.m. Saturday.